Many feelings can be expressed by flowers, and this non-verbal language is very popular nowadays. Each one of us has sent at least one message to someone with the help of a flower. Sometimes whole conversations between two lovers are spoken through flowers. -a single white rose is used by someone that wants to say ‘I’m sorry’ to his/her significant other. It also has some other meanings. Since medieval times white roses are considered to be a symbol of light, purity and innocence, so sending a single white rose may also mean that you consider that person to be pure, or that your love is very pure. -a single yellow rose expresses happiness and love. Sending a single yellow rose to your half means that you are happy with your love and relationship. But be careful because single white roses have two meanings! They can also express jealousy, so sending someone one can mean that you are jealous. The best thing to do is to attach a note to the rose, explaining exactly what you mean. 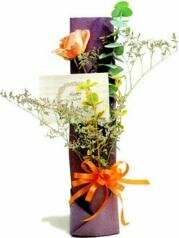 -a single peach rose is used to send a message of friendship to a best friend or even to a lover. -a single purple rose expresses beauty. So if you want to tell someone he/she is beautiful send him/her a single purple rose. -a single pink rose is an elegant way of thanking someone because this is what pink roses transmit: gratitude. Finally, a single black rose says ‘it is over’. This is a way of ending a relationship – sending a single black rose together with a note. But, as mentioned before, the single red rose is considered to be the most beautiful and romantic. Even from the ancient roman times lovers give each other red roses. In those times, roses were the symbol of the roman goddess Venus, the goddess of love, so ever since then a single red rose clearly states ‘I love you’. Also the red rose petals are used to symbolize love, and to create a romantic atmosphere. They can be left to float in the bath tub, or simply spread throughout the house or near the fireplace. If your lover is away you can add some rose petals to your letters. Red roses have been a continuos source of inspiration for artists everywhere and thousands of paintings and poems have been written inspired by roses or by a single red rose. It has been said that a single red rose speaks volumes, so choose the fines rose and send it to someone you love now. This entry was posted on Sunday, April 23rd, 2006 at 11:49 pm	and is filed under Romance And Relationships. To swap links, simply leave a trackback from your own site.